Active Mini Displayport to DVI adapter is designed to connect a Mini DisplayPort or Thunderbolt port compatible PC or graphic card to HDTV, monitor, or projector with DVI port. 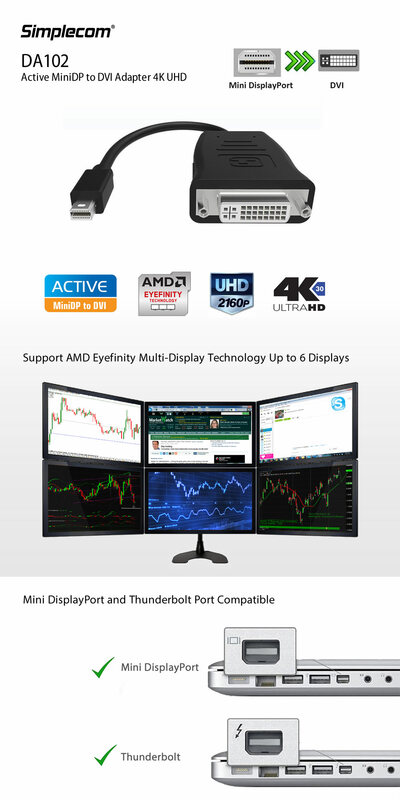 Support AMD Eyefinity Multi-Display technology up to 6 displays. Extend or Mirror your Laptop/PC to a second display for an expanded workstation, home theatre or show presentations on a projector at office, school or home.